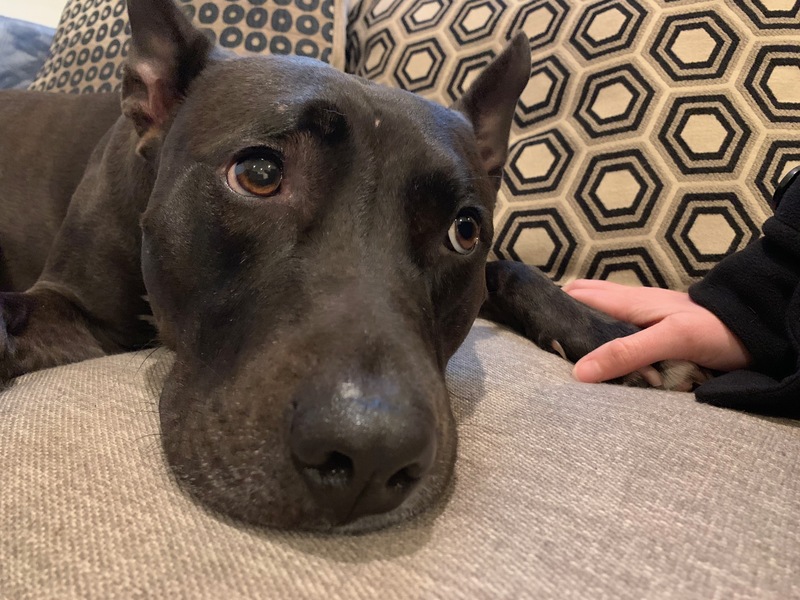 For this Los Angeles dog training session, we share tips to help 3 year-old Pit / Terrier / Taiwanese Mountain dog mix Lucy learn to look away to stop her from acting aggressive to other dogs when her guardians are around. We started the session out by discussing the importance of exercise, rules and structure. This is more important in this case as Lucy is only aggressive to other people when her guardians are around. She will need to see them act like leaders through their actions in order for her to not feel like her way of contributing is to protect her humans by acting aggressive to other dogs when they are around. I have found that many dogs who act aggressively towards other dogs are doing so to increase the space between them and whatever it is they are reacting to. This usually happens because the dog is looking at something it doesn’t agree with and they tend to lock in and stare. The closer the thing comes, the more intense the reaction becomes. Stare leads to lick lipping or teeth baring, which can lead to biased tails, forward ears, etc. These are not always in this order, but knowing what to look for can be extremely helpful so that the humans can get the dog out of there or stop things from escalating. Redirecting a dog’s attention away is a powerful way to stop dog aggression. This allows you to deescalate the situation before it reaches a tipping point, something we refer to as above threshold. A few weeks ago I worked with a dog who had a similar dog aggression problem so I wanted to share the video we shot in that session where we used free shaping to teach the other dog to look away. You can learn how to teach a dog to look away in the free positive dog training video below. The great thing about this approach to stop dog aggression is the dog figures it out on their own instead of having a human micromanage them. The human offers some guidance and sets up a scenario where the dog can succeed, but it’s the dog who does the work. Another problem was Lucy’s reaction when she heard the doorbell, getting animated and charging the door when ever she heard the tone. I showed the guardians a way to condition the dog to move away from the door when she hears the door bell. If the guardians incorporate more rules, increase her daily exercise (keeping an exercise journal will help them find out how much is enough) and use passive training to reward and motivate her to offer desired behaviors, the look away exercise should be the final step to teaching the dog to stop acting aggressive towards other dogs. While most of my clients only need to see me once, dogs with aggressive behaviors often fall into that category of needing more than one session. I asked the guardians to call or text when they have any questions or if things stop working so we can make adjustments or schedule a follow up call if needed. To help the humans remember all the dog behavior tips I shared in this in home dog training session, I shot a roadmap to success video that you can watch below.